Usually a desired safety or reliability level of the structure is assessed in a semiprobabilistic way: the characteristic values of loads and material constants are taken from statistical analysis of available data, whereas the calculation of strength is performed in deterministic way. The present paper shows that at least in ultimate load analysis it is possible to evaluate the safety factor taking directly into account random scatter of loading and/or properties of material. Such an approach is based upon the theory of Stochastic Programming and upon the results obtained recently in the analysis of reliability of complex systems. 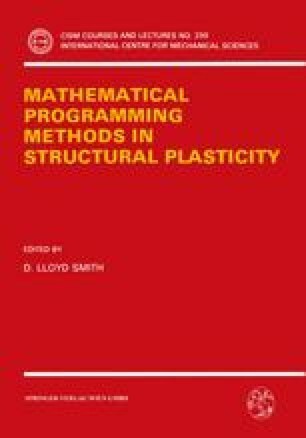 It is demonstrated that stochastic problems representing the static and kinematic theorems of ultimate load analysis can be converted into equivalent deterministic Mathematical Programming problems. Usually the latter turn out to be non-linear even for piecewise-linear yield criteria. The second part of the paper deals with the bounds on reliability of hyperstat.i.c structures. Numerical examples illustrate the conceptual power and numerical efficiency of the proposed models.